Priority for us was having a good viewing spot for Mickey’s Boo To You Halloween Parade, so we sat down on the kerb in front of Cinderella Castle. It meant that we could only just see the Hocus Pocus Villain Spelltacular on the stage, as there were lots of people in front/behind us. Me being quite short, didn’t get much of a view to be honest, and I didn’t manage to see much of it, and the photos I did take are pretty pants, but I’ll share them anyway! Steve did video the show as best he could, and you can watch that below, or over on my YouTube Channel. 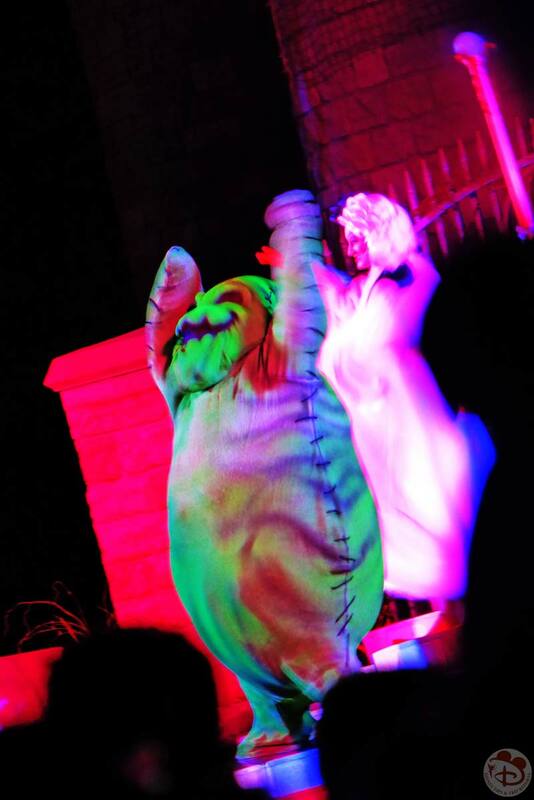 Since we are going to MNSSHP twice this year, I’m going to make it a priority to see the show properly this time around! We then waited for the parade to start. THIS is what I had been waiting for! Before the start of the parade, the Headless Horseman rides by – but it was so dark, that a photo of him was impossible for me. Steve took a video of the parade, and you can see the Headless Horseman riding by – it was pretty spooky! You are allowed to sit on the kerb to watch the parade, but when the horseman goes by, you must have your legs up on the pavement and not on the road – Cast Members walk by and let you know, so allow yourself room to do that. Once the parade starts, you can put your feet back. As with all nighttime parades, the lights do get dimmed, so keep an eye on children, and don’t let them wander around. 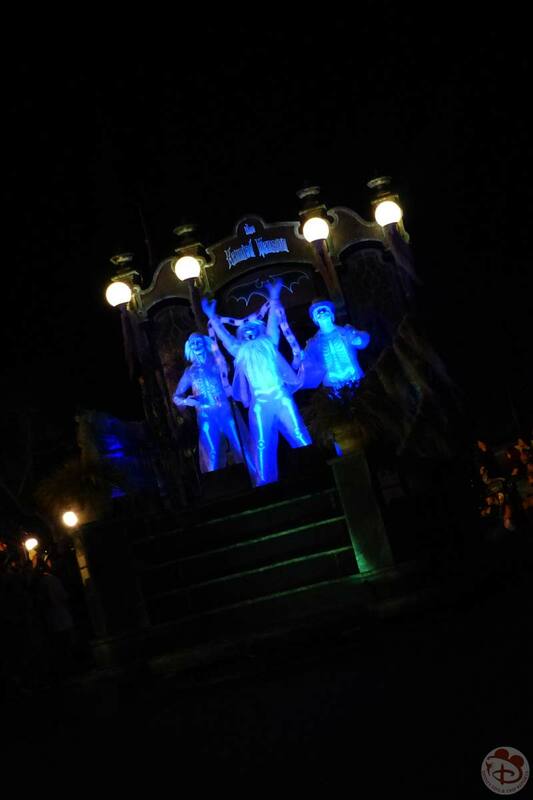 Whilst the event is billed as Mickey’s Not-So-Scary Halloween Party, there are parts of the parade, that might give younger children a bit of a scare. Notably the gravediggers when they crash their spades to the ground, and swish them around creating sparks – it’s very cool to watch though – loved that part of the parade. The ghost dancers (or whatever they’re called) might also give younger kids a bit of a spook. If you’re thinking about going to the event with young children, and aren’t too sure, please watch my video – or any on YouTube of course – and you can then judge, or show it to your kids in advance. Photos of the parade were a struggle for me – watching the parade in front of the Castle means that is very dark (compared with when we watched it at the top of Main Street USA), and my camera settings were just not having it! It’s what accelerated my want to buy a DSLR camera, so I really hope I can get some good shots this year to do the parade justice! The parade was awesome, and we loved it! There were lots of fun floats, and the music is so catchy – you’ll be singing along in no time!